So, the battle of the puppy training pads continues. Lucky for all of us my puppy, Charlie enthusiastically loves to pee, and get rewarded for going on the pads. Today’s test:Hartz Maximum Protection Puppy Pads. 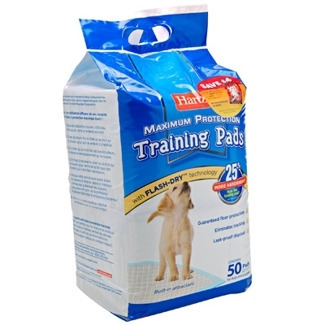 Hartz Living Puppy Training Pads for Dogs and Puppies are made with an absorbent polymer and cotton fluff which allows the pads to absorb moisture and odor with no mess. These pads are specially designed to absorb moisture fast and dry to the touch to prevent leaking and tracking. The Hartz training pads are made with plastic backing and tear resistant materials to provide strong protection for your floors and ensure easy disposal. I’m relying on these pads not just for house breaking Charlie, but also extended stays indoors, traveling, and our picnics in the park. They are excellent for senior and ill dogs too. All in all they work. I think they work just as well as all the other brands. The price is in line with what I’ve seen $15.50 for a 50 count bag. I bought my bag of Hartz Maximum Protection Puppy Pads at Walgreens. But you can buy them at Amazon for the same price.